Just finished a kitchen upgrade for a lovely client in Ashbourne Co Meath. A very tight budget – its amazing what results you can get, with a little bit of thought and an overall theme. Initial brief from client was “make it as good as possible and spend as little as possible” – so I did! 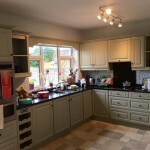 My client had just moved into a new home – that she had bought from an elderly couple, so the house was quite dark and she hated the tired furniture and fittings which were also very outdated. 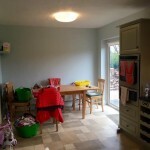 With such a tight budget, my only option was to work with colour and themes – that was also suitable for a young growing family. We started by lacquering the existing units in a modern fresh colour, then changed the handles. We also changed the wall colours and painted the tiles. And we’re not finished yet – next we change the lighting and the georgian fixtures on the patio doors. When budget allows I am recommending a wooden fifty style table with faux leather chairs, easy to clean those sticky finger marks from children. On a tight budget? Need some ideas? Colour Themes? Call me or email me here.